When Tim Schroeder, founder and CEO of CTI Clinical Trial and Consulting Services, was hunting for a location for his firm’s new headquarters, he had a great experience working with Tri-County Economic Development Corp. Better known as Northern Kentucky Tri-ED, the nonprofit economic development organization helped Schroeder with everything from finding training grants to identifying locations the company hadn’t considered. Now that CTI, which helps companies develop drugs and medical devices to obtain regulatory approval, has been in Covington for more than a year, the firm needs help with workforce development. Previously, Tri-ED’s focus on primary industries, which includes automotive, aviation and aerospace, financial services, food and flavorings, life sciences and logistics technology, would have limited its role in helping CTI. That’s about to change. A new chief executive officer. A new mission. A new vision for Northern Kentucky. 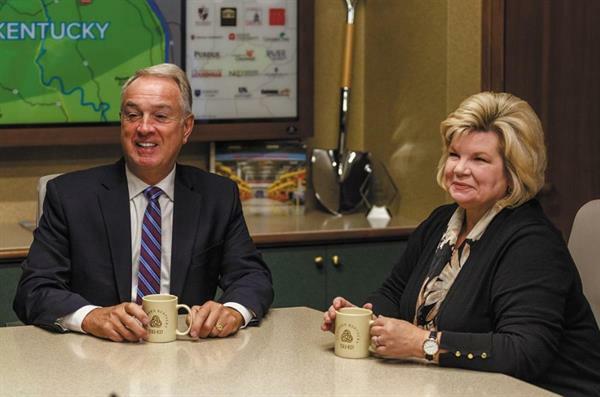 Those are the lofty goals Northern Kentucky’s government and business leaders have set for the next evolution of Tri-ED, which is tasked with attracting and retaining business in Boone, Campbell and Kenton counties. Gary Moore, judge-executive of Boone County and Tri-ED’s board chair, said this will be the largest change in the economic development organization’s 31-year history. “We need to step it up,” Moore said. The result will be an organization that is expected to be more aggressive, creative and wider reaching. The changes are occurring for several reasons: A lack of development-ready sites, Gov. Matt Bevin’s changes to the Kentucky Cabinet for Economic Development and the 2017 death of Bill Robinson – one of the founders of Tri-ED who had served on the board since its start – all played a factor. Ohio also became more competitive under Gov. John Kasich, making it harder for Northern Kentucky to pull companies from across the river. “We’ve gone through a period of 10, 15 years where we lost momentum,” said Bill Butler, chairman of Corporex. The nonprofit, which receives about 80 percent of its funding through a tax on rental cars from Cincinnati/Northern Kentucky International Airport, has played a role in bringing more than $8 billion in capital investment to Northern Kentucky. 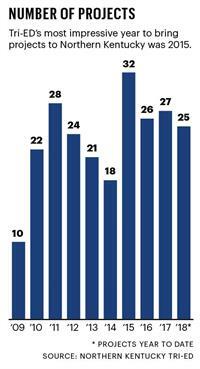 In the past decade alone, its work has resulted in more than $4 billion in investment and more than 22,000 new jobs. Some recent projects it has landed include DHL Express’ $108 million expansion in 2015 to grow its aircraft fleet and international express volumes and CTI opening its headquarters in Covington last year, a $36.4 million project that could create up to 500 Kentucky-resident jobs. For its revamp, Tri-ED brought in Prager Co., an Illinois-based consulting firm specializing in economic development and organizational change. 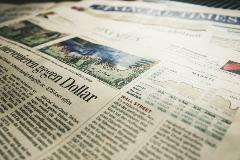 President Adam Prager said economic development organizations need to evolve to meet changing needs. Prager Co. has given guidance and advice to Northern Kentucky leadership throughout the review process over the last eight months. “You’ll see a more aggressive organization,” Prager said. Tri-ED is developing a more forceful business development strategy in terms of attracting new companies to the region and increasing services on the retention side, and will work more aggressively to partner with cities and counties to identify development sites and the resources needed to make them attractive to potential users. Robinson’s death was a big blow and forced Tri-ED to rethink its mission. Karen Finan, interim CEO of Tri-ED, said Robinson’s vision, passion and network throughout the state and country helped improve Northern Kentucky’s expansion efforts. Aaron Bludworth, CEO of Fern Exposition & Event Services, helped lead the process of reviewing Tri-ED’s function as one of the chairs of the mission review task force. Tri-ED had become an agency trying to serve the private sector that “in a lot of ways it doesn’t understand,” Bludworth said. “We could be doing this a lot better,” he said. The loss of Toyota Motor Engineering & Manufacturing North America Inc.’s headquarters in Erlanger last year accelerated some of the changes that are needed, Finan said. A lack of certain available real estate also has made Tri-ED go after different types of projects. Going forward, the organization will work together with private developers to improve options. Change is underway at Tri-ED. Dan Tobergte, CEO since 2004, resigned in August. Wade Williams, senior vice president, announced he will leave the organization in December. 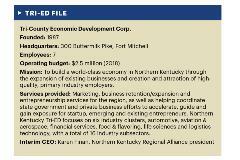 Finan, previously senior vice president at Tri-ED, is now CEO of the Northern Kentucky Regional Alliance. Finan has helped guide the organization during the mission review process. “We – as a community, as an organization – realized we needed to go in a new direction,” she said. When Tri-ED was founded, the organization was a public-private partnership. Over the years, the organization became more of a quasi-governmental agency, acting as the economic development arm of Boone, Campbell and Kenton counties. Through this mission review, Tri-ED decided to return to its roots and create a deeper connection to the private sector. The most immediate changes for Tri-ED will be the change of its board. The new format will include up to 23 members with the executive committee consisting of four private sector members and three county judge-executives. The chair of the executive committee also will be from the private sector. The CEO search committee is a good example of where Tri-ED wants to go. Candace McGraw, CEO of Cincinnati/Northern Kentucky International Airport, is chairing the committee, which includes one judge-executive. The rest of the committee is from the private sector. Tri-ED was limited by its focus on primary industries. The new Tri-ED, what McGraw referred to as Tri-ED 2.0, will expand its capacity to improve the business climate in Northern Kentucky. Finan said there are exploratory conversations taking place about how Tri-ED and the Northern Kentucky Port Authority could work together. Tri-ED ultimately may not be the organization that performs the location enhancement, but it will lead that discussion. Kris Knochelmann, judge-executive of Kenton County and a member of the Tri-ED board, said Northern Kentucky leadership knew it needed to do more to have shovel-ready sites available for projects. “We do not have the inventory like we thought we had,” Knochelmann said. With businesses making location decisions faster, it is imperative to have land ready to go for companies. 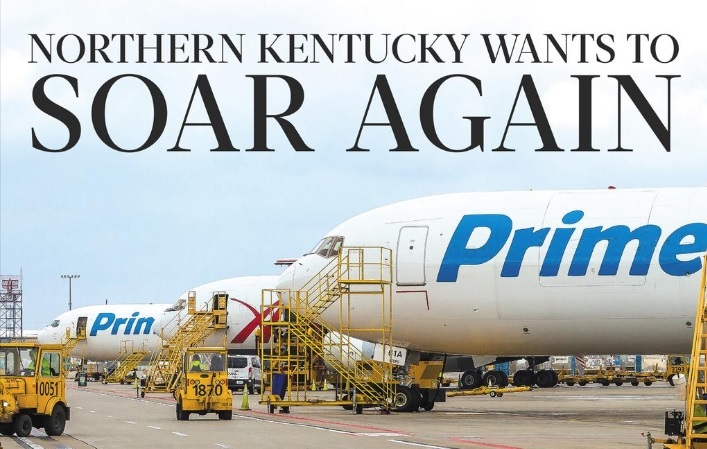 Tri-ED also needs to be prepared to handle the growth that will be coming to Northern Kentucky with Amazon.com Inc.’s Prime Air hub at CVG. Amazon has yet to start construction on its planned 3 million square feet of buildings, and it only has 20 planes flying out of CVG. Eventually, Amazon expects to have more than 2,700 jobs at CVG and a fleet of more than 100 Prime Air cargo planes. “We have to be ready and support the businesses around Amazon,” Knochelmann said. Finan sees Tri-ED playing a big role in helping the region deal with the growth that will come with Amazon, including roads, utilities and workforce needs. Paul Verst, CEO of Verst Logistics, said the renewed Tri-ED needs to help the existing business community, especially with workforce retention and attraction. He said it is a struggle to find enough employees. “We’re all trying to steal from each other,” Verst said. Kim Halbauer, senior vice president and director of private banking for Fifth Third Bank, is treasurer of the Tri-ED executive committee and part of the mission review task force. She agreed that improving the region’s workforce is a key challenge. “If we can’t solve some of the issues around workforce, we won’t attract business to come to this area and we won’t be able to retain,” Halbauer said. Butler said he hopes to see Tri-ED’s efforts refocused on Northern Kentucky’s urban core. Increasing the financial buy-in from the private sector is a return to Tri-ED’s original structure, Butler said. And it will allow Tri-ED to better fund the region’s business needs. Details on how much Tri-ED will request from the private sector have not been determined, but Finan expects Tri-ED’s operating budget to increase to meet its new mission. “The players involved in economic development have to keep their foot firmly on the gas,” Prager said. Verst, Butler and others said the private sector is ready to step up in whatever way Tri-ED needs. “We’re prepared to make a significant contribution that they can bring this around as they’ve structured it,” Butler said. “This is the time to make it happen in Northern Kentucky,” Knochelmann said.